In 1993, MIT's chilled-water plant could not meet the campus’s cooling requirements. MIT called in Hemant Mehta to troubleshoot; during his first visit, Mehta identified the issue: the operating sequence of the 4,000-ton steam turbine-driven chiller was incorrect. Within two hours, the operating sequence was recalibrated and chiller-steam consumption decreased from 12 lb/ton-hour to approximately 9 lb/ton-hour. Since then – in 1994, 1999 and 2009 – MIT’s system has needed expansion to meet the campus’s requirements, and WM Group has been called back to the work on the projects. In 1993, WM Group identified a number of improvements and upgrades that contributed to a more effective and efficient system. The capacity was affected by the fact that the 4,000-ton steam turbine was operating at full speed with compressed guide vanes only partially open. After slowing down the turbine, the guide vanes opened up and steam requirements were reduced by 25 percent. 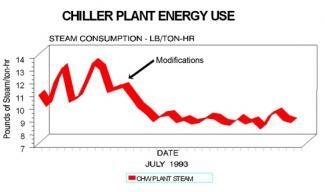 Consequently, the cooling towers required less heat rejection and system performance improved. Additionally, MIT operated two plants independently. WM Group designed the optimized system to operate together. The main plant’s pumping system was converted to a primary pumping system and two 5,000-ton chillers were added to the existing plant. For the most recent project, WM Group teamed with Vanderweil Engineers. WM Group’s scope was to find an optimum way to add an additional 10,000 tons of capacity. The current plant footprint was not adequate to add capacity. WM Group performed a system configuration analysis for the chiller type as well as space required. The option to build the new chiller plant behind the existing main plant over the railroad was selected. The cooling towers of the existing main plant are behind the railroad as well. WM Group had installed a combined sump at Louisville Medical Center and offered the same concept to MIT. WM Group did the schematic design of the new 10,000-ton expansion with four 2,500-ton electric chillers and the design of common sump.